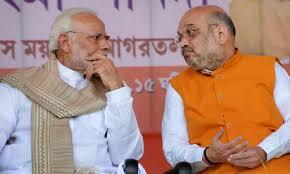 BJP holds CEC meeting, expected to release first list of LS candidates soon - Integration Through Media ....! NEW DELHI, (ANI): The Bharatiya Janata Party (BJP) late on Saturday held a meeting, presided over by Prime Minister Narendra Modi and party president Amit Shah, to shortlist candidates for the ensuing Lok Sabha elections. The meeting of the BJP Central Election Committee (CEC) at the party’s headquarters here that culminated at 2 am on Sunday was held to deliberate on candidates that the part will field in various constituencies in 11 states, according to sources. Union Ministers Sushma Swaraj, Rajnath Singh, Arun Jaitley and Kiren Rijiju were among those who attended the meet. Bihar, Uttarakhand, Assam, Arunachal, Manipur, Tripura, Andhra Pradesh, Maharashtra and Jammu and Kashmir figured in the deliberations, sources said adding that candidates for seats in the states of North East and in south India were also discussed. “In all these states seats have been left vacant in places where the BJP is not very strong to facilitate candidates from regional parties or other big party leaders who would support the party,” sources said.States that will go to polls on April 11 in the first phase of the upcoming seven-phase Lok Sabha elections are Andhra Pradesh, Assam, Bihar, Jammu and Kashmir, Maharashtra, Uttar Pradesh, Uttarakhand and West Bengal. The BJP Central Election Committee is likely to meet again on Monday and by March 22 the party may announce the list of all candidates, sources said.Meanwhile, Congress released its fourth list of candidates on Saturday.